If one of your employees is injured or needs to take time off for a new baby, how will they pay their bills for an extended period away from work? By providing Group Disability Insurance, Las Vegas employers communication a true concern for their employee’s welfare and that of their family. It makes a positive statement to potential hires, as well as those already in your employ. You carry workers compensation to cover your employees in the event they are injured at work; that coverage is mandated by law. Adding group disability insurance demonstrates that your commitment to your employees goes above and beyond the minimum requirements. Coverage for lost wages due to temporary disability due to illness or injury is referred to as Short Term Group Disability Insurance. Las Vegas employees often use this benefit to eliminate the income gap in between benefits and lost wages, to cover time off for unpaid maternity leave or to cover time off due to a short term illness or injury that goes beyond available paid time off. The exact length of coverage through short term disability will vary per policy, but can run anywhere from three months to two years. Long term disability insurance is for those more extreme cases of illness or injury, where an individual may be unable to work for several years. Some employers will choose to provide only short term disability, others will provide the long term disability option as well, either as a paid or optional benefit to their employees. 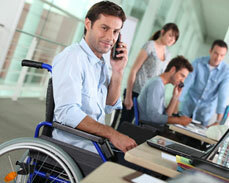 Disability insurance is generally considered the perfect complement to a strong group health insurance package. The group health benefit covers your employee’s medical expenses, while the disability insurance covers the lost income during the time of a significant physical recovery period. Employees with significant savings and personal assets may not appreciate this benefit as much as those whose limited savings would easily disappear over an extended period of time without a paycheck. As with all our benefit offers, Employee Benefit Solutions, Inc. is hear to assist you in understanding and selecting the best benefits for your particular class of employees. Should group disability insurance be one of your choices, we will be available to assist in the claims process and administration, should the need arise. If you’re looking for Long Term Group Disability Insurance in Las Vegas or Short Term Group Disability Insurance in Las Vegas, Employee Benefit Solutions, Inc. has plenty of carriers to select from. We would be happy to discuss this and any other employee benefit needs you may have.